First of all, we would like to ask you, what are the characteristics of Bahrain’s real estate market that distinguish it from other real estate markets in the region? Bahrain’s market is stable with no sudden jumps that frighten investors, it is growing slowly but steadily. Bahrain is a small country that attracts GCC investors due to its strategic location near Saudi Arabia, Qatar, and Kuwait. Moreover, Bahrain is not completely open to foreigners and laws are strict, and most projects are well planned and thought. The contribution of the real estate sector to the GDP in Bahrain is around 5%, indicating that the market is still growing. In addition, many of the new areas in Bahrain are under construction. 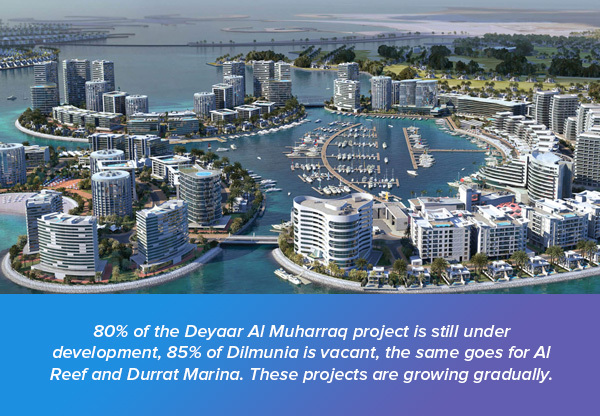 For example, 80% of the Deyaar Al Muharraq project is still under development, 85% of Dilmunia is vacant, the same goes for Al Reef and Durrat Marina. These projects are growing gradually. We see the real estate market is now weaker than it was in 2014 and the beginning of 2015. What are the main obstacles that are hindering the growth of the real estate sector in Bahrain? There are important actions that should be taken by the government. Bahrain needs to be advertised in the Middle East as a business hub to attract investment in real estate and other economic sectors. Today, Dubai is working strongly in this direction. Bahrain has many opportunities, but we have not yet been able to send a strong message about Bahrain abroad. The government should support the sector and convey a positive image of Bahrain’s market abroad. As for the market decline, Bahrain is the least affected country by the oil crisis, but the reasons for the market weakness are known, they include the oil price crisis of course, the political situation in the region, and other reasons, which made investors more cautious. People are now more inclined to deposit their money in banks in search of security, but in Bahrain we can easily win the confidence of investors in the region because we are the least affected out of the Gulf countries, we just need strong publicity. I’ll give you another example: the Egyptian market has a huge purchasing power, but so far they do not know about the investment opportunities in Bahrain. Also in comparison to Saudi Arabia, the people of the Eastern Province are naturally aware of Bahrain, but the people of Riyadh and the Western Region know less about it. Kuwaitis like to invest in Bahrain, but recently, we have not given much attention to advertising the advantages of Bahrain. I think in the near future the government will work harder and smarter to create opportunities for investors and create an atmosphere that is conducive to business. 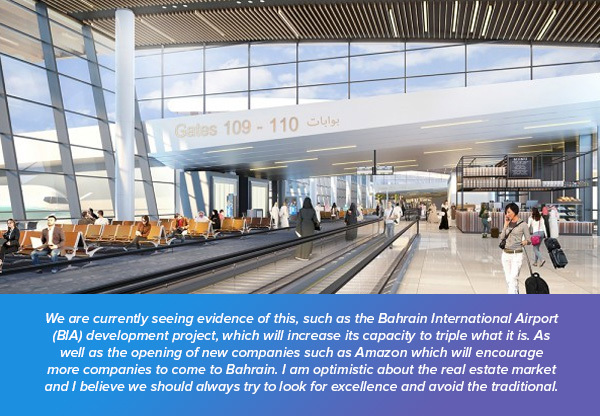 We are currently seeing evidence of this, such as the Bahrain International Airport (BIA) development project, which will increase its capacity to triple what it is. As well as the opening of new companies such as Amazon which will encourage more companies to come to Bahrain. I am optimistic about the real estate market and I believe we should always try to look for excellence and avoid the traditional. To clarify, investors now tailor new and unique investment ideas that are suitable for all buyers. The retail sector in Bahrain is strong and has many opportunities. Is Bin Faqeeh considering investing in this sector? In my opinion, the retail market in Bahrain does not need more retail complexes. We need to create purchasing power first that is able to accommodate these new complexes that are under development. But in our vision, if we ever think about investing in this direction, we will choose a mini-mall or small complexes that consist of two or three floors at most and serve citizens in their own places of residence. The mini-mall will feature all amenities, entertainment, cinemas, and some shops that citizens need in their area as well as a number of restaurants. It is clear to see that the tourism sector in Bahrain is not growing as required, as we see a decline in the number of tourists, especially after the decline in oil prices, has this affected the target customer segment at Bin Faqeeh? Is there a greater focus now, for example, on citizens? From the beginning, we at Bin Faqeeh have been initiating contact with investors rather than waiting for them. Our ambition is to have representative offices in all the GCC countries without exception. We also plan to have a presence in the Middle East within a year or two at the most. We are not lacking in anything to be able to open international offices, as in Dubai, for example, where there are real estate companies with offices in India and Russia. Why don’t we do the same? The matter needs to be studied and also needs a strong and attractive real estate portfolio to attract investors. 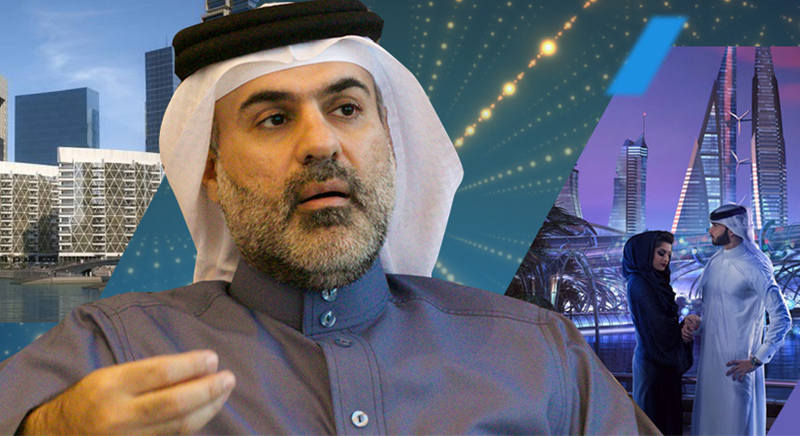 Bin Faqeeh is the only company in Bahrain that plans to go global, we want to go to investors where they are. Bahrainis are always a priority to us, we offer them the first pick, then we spread to our customers throughout the GCC. In a recent analysis conducted by Weetas, we found that local real estate investment is the main driving force of the real estate sector in Bahrain. Have you provided real estate products that are only suitable for Bahrainis? We have some projects in closed areas. Initially, the company’s marketing orientation was to target Saudi investors. Many Bahrainis were concerned about the company’s ability to deliver on its promises and deliver projects, but with the development of the company, the crisis ended and Bahrainis’ confidence in us increased. Today, the largest segment of our investors are Bahrainis. Evidence of this is the Sidra project in Diyar Al Muharraq. 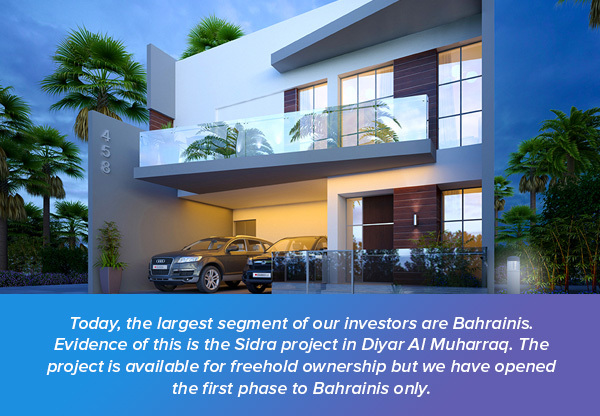 The project is available for freehold ownership but we have opened the first phase to Bahrainis only. The value of real estate transactions declined in 2015 and 2016 in comparison to 2014, what do you think are the reasons for this decline? The reasons for the decline are mainly due to the entry of a lot of developers and the availability of more supply than demand. I remember in 2012, 2013, and 2014, there were not many developers. But in the past period, many developers have regained confidence, leading to the entry of a large group of them at the same time. This, in turn, lead to a state of oversupply, in addition to other factors, including oil prices and others. In the future, can the relation between oil and real estate in the Gulf be reduced? I do not think so because we were raised on oil, it will take a lot of time to balance things out. What are the directions of Bin Faqeeh under the current conditions? We have overcome many challenges at Bin Faqeeh, as we have delivered 31 projects and more than 2,000 housing units. Our current approach is to become a well-known Gulf-wide company, and in 2020 we aim to enter the markets of India, Russia, and other countries with an inclination to invest in the Gulf. We started with a sales office in Bahrain that we relied on in all our sales transactions. Today we have 3 offices in Saudi Arabia, an office in Qatar. Now we are getting ready to go to Moscow. We are also opening a branch in Kuwait within days. Are there any new projects in Bin Faqeeh’s pipeline that will be launched soon? Currently, we are thinking of stopping any new projects until the second quarter of 2018. We are not afraid of the market situation, however, we want to focus on finishing projects that are still under construction, most notably the Waterbay and Layan projects. The new projects we will launch in the future are well thought out and present new ideas unlike anything before, they are also targeting new categories of investors, most importantly young people. Are you considering developing a tourism project? We are now working on making the Layan project a perfect tourism destination for the weekend. It will be a wholly integrated project to meet all family needs and we have provided everything to be suitable for the entire family. I believe it will be unique and will present a new idea that will be introduced for the first time in the world. Do you expect Bahrain to become Dubai or Singapore in the future? What distinguishes Bahrain from these places? Answering the second half of the question, Bahrain is a country that easily adapts to investors because it is a small market, and that is what sets us apart. As for competing with other countries, we can, but we need a vision. Moreover, the investor in Bahrain needs to be educated. Instead of copying others and developing typical projects, it is preferable to set up well-planned projects. Bin Faqeeh was the first company to develop projects on the island of Dilmunia and in Bahrain Bay, and we were one of the first real estate developers on Reef Island and Durrat Marina. For example, our “The Treasure” project in Dilmunia was one of the most successful projects and was sold quickly. Some think we are a reckless company, but we build all our projects on scientific studies and estimates. We are the only company developing a real estate project in the Bahrain Bay area for example. Imagine an area with these potentials with no real estate investments, while other areas are swarming investors and are in a state of oversupply. 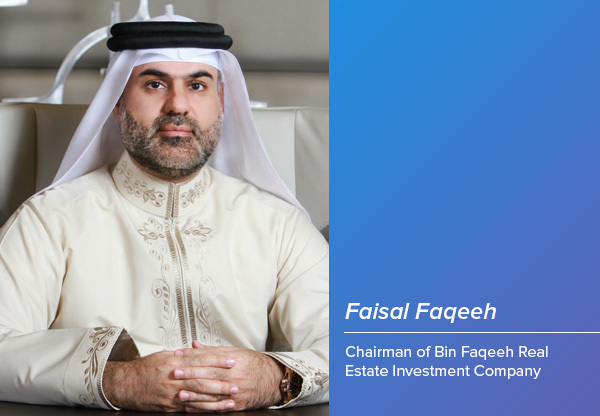 We have noticed that when mentioning Bahrain’s real estate market to many investors, Bin Faqeeh is the first thing that comes to mind, what is the secret behind this trust that Bin Faqeeh has gained? The timing of our launch, in 2010, was a difficult time, the Gulf markets were suffering from the consequences of the global financial crisis, most companies were afraid of real estate investment in general. Moreover, we did not stop construction during Bahrain’s political crisis in 2011. The main difference between us and other real estate companies is that we were able to make properties a friend to the investor. Our marketing approach depends on direct access to individuals across all levels. We also have many activities in Bahrain such as the Holy Quran Contest and other community development activities. This presence earned investors’ trust, we also did not back down from launching any project, nor did we delay any delivery. We are very happy with the trust that the people of Bahrain have in us and we promise them further development. We also look forward to building a strong relationship of trust with all the people of the Gulf Cooperation Council. What is your vision for the last quarter of this year and 2018 under the new laws and current circumstances? I see the market is promising, we achieved record sales in October. The point here is to advertise and attend social activities on the ground among people. I invite other developers to do this, I also invite them to create complementary departments. Companies should not rely on real estate development alone, but also add other departments such as marketing, sales, after sales services, etc. to provide full services to investors and encourage them to invest in real estate. Summarizing the situation, I am very optimistic about the market situation and expect a noticeable improvement in the near future.